Full disclosure: I love mochi. I love rice. Glutinous rice? Even better. Does anyone ever ask you, “if you could only ever have rice or pasta for the rest of your life, which would you choose?” It’s a cruel game. I think I used to say “pasta, duh,” but I changed my mind: rice. Duh. So when I went to Japan for the first time four years ago for New Year’s I was delighted to discover that mochi is a traditional holiday food. In fact, I woke up, and Yuji’s parents served us zoni for breakfast. Zoni is a clear soup typically eaten on New Year’s – made with a dashi or miso broth – containing the glutinous rice cakes known as mochi, as well as vegetables and fish. The mochi was cut into medium-sized rectangles and was chewy and hearty and satisfying. I was warned by Yuji’s parents not to choke, since the sticky rice squares can easily catch in your throat if you’re not careful. That mochi was not sweet. Nor did it taste like the weird brown stuff labeled mochi sold in health food stores here in the U.S. that we served as “dessert” for the gluten-free kids at the farm camp where I worked. No, this mochi was smooth with the subtlest texture on the outside and tasted just like the thing you’d want to eat if it was cold outside and you were sipping green tea. It’s Japanese comfort food at its finest. And good mochi stretches like taffy or mozzarella cheese when you bite onto it and pull your chopsticks away. 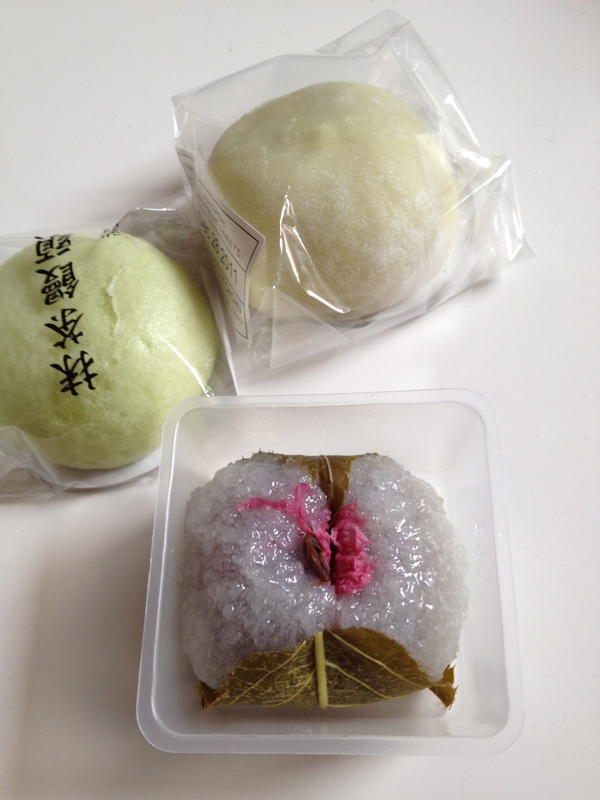 Mochi is eaten year round in Japan and other parts of Asia, but this time of year it’s common to buy and give as gifts. I’ve also been invited to take part in my Japanese language school’s annual mochitsuki, which means rice pounding. When you’re in NYC and have mochi on the brain you can go straight to the source. Not Tokyo, but the next best thing: Minamoto Kitchoan, a Japanese confectionary shop near Rockefeller Center in Manhattan. 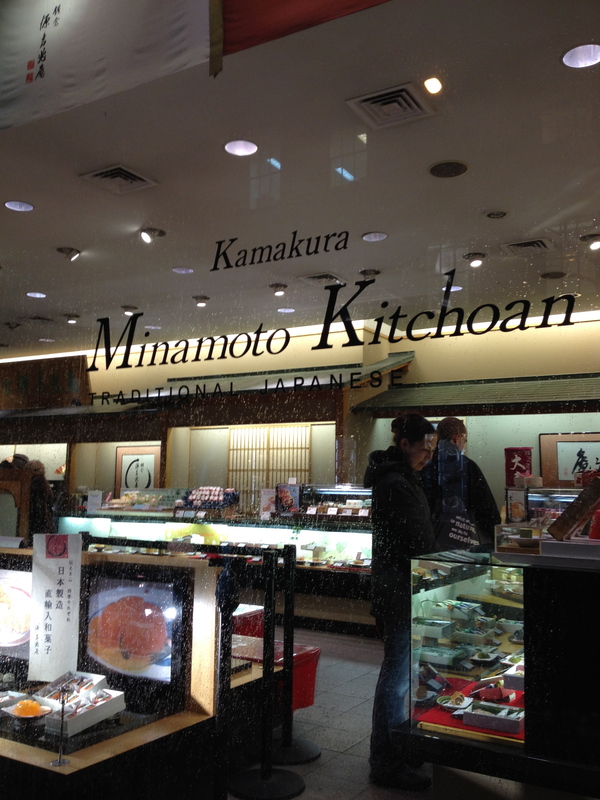 Minamoto Kitchoan is a shop based in Tokyo, but with outposts in New York, London, Singapore, San Fran, and Shanghai. 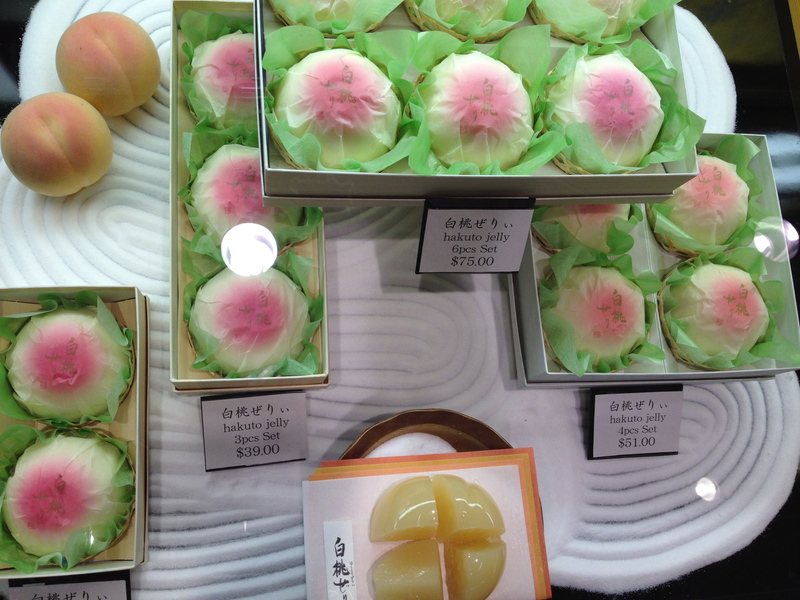 Their speciality is wagashi, little sweets like mochi typically eaten during a Japanese tea ceremony. I took a trip there this week (they’re on 5th Ave. and 49th St.) and took shelter from the rain and delighted in the beautiful confections wrapped in perfect little packages. 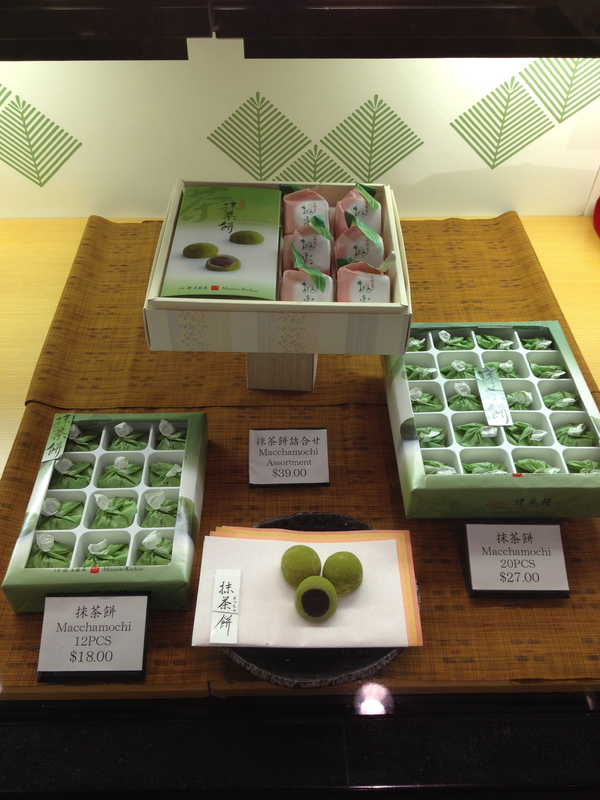 Some are made with green tea, some are filled with sweet red bean. One of my favorites is sakuramochi which looks in fact like a beautiful little cherry blossom. You can see from the price tags that sweets from this shop don’t come cheap. But it’s a once-a-year special treat kind of thing. Unless you form an addiction, which I’m not ruling out. 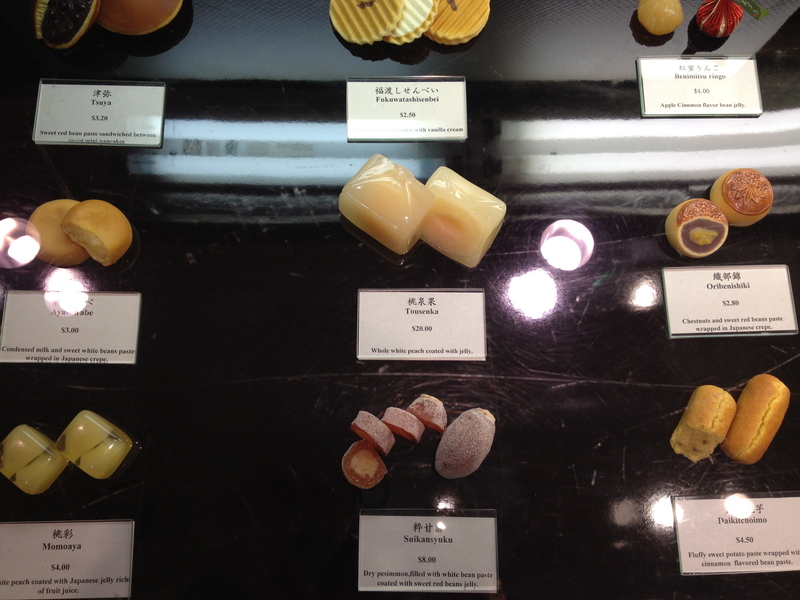 The individual mochi pieces are only about $3 a piece. 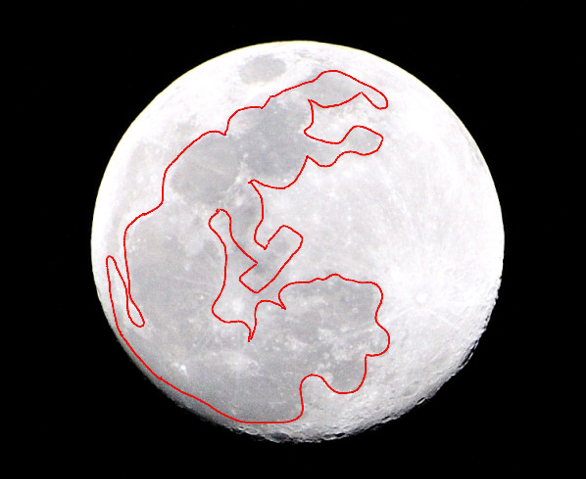 In the U.S. we say there’s a man on the moon right; in Japan they say there’s a rabbit on the moon. Not only that, the rabbit is pounding rice on the moon, making mochi. Mmm … mochi, I completely agree! And this looks like a great shop – thanks for the post.